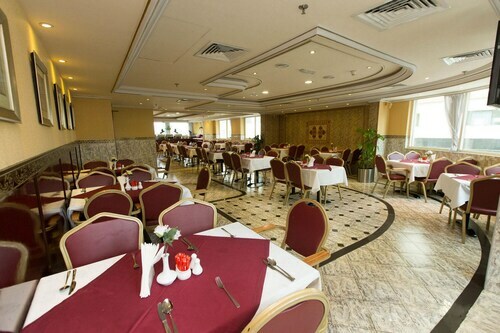 Located in Deira, this hotel is within 1 mi (2 km) of Fish Roundabout and Al Ghurair Centre. 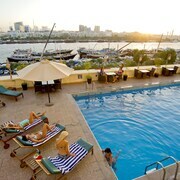 Gold Souk and City Centre Deira are also within 2 mi (3 km). Union Station is 5 minutes by foot and Al Rigga Station is 12 minutes. 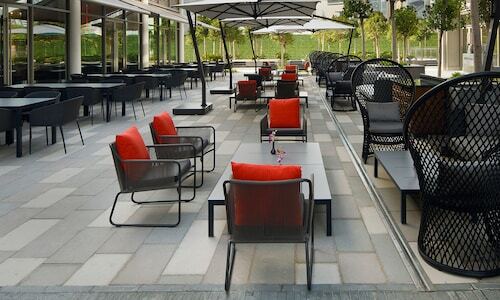 Located in Trade Center, this hotel is within a 15-minute walk of Dubai International Convention and Exhibition Centre and Dubai World Trade Centre. Dubai Mall and Burj Khalifa are also within 3 mi (5 km). World Trade Centre Station is 9 minutes by foot and Emirates Towers Station is 19 minutes. 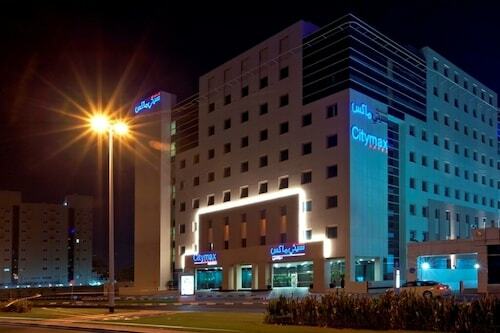 Located in Bur Dubai, this hotel is within 1 mi (2 km) of BurJuman Mall and Textile Souk. Dubai Museum and Gold Souk are also within 3 mi (5 km). Al Karama Station is 15 minutes by foot and Saeediya Station is 16 minutes. This Palm Jumeirah resort is on the beach, 1.1 mi (1.7 km) from Aquaventure, and within 9 mi (15 km) of Jumeirah Beach and Dubai Marina. Dubai Marina Mall and The Walk are also within 9 mi (15 km). Dubai is perhaps the quintessential modern city: It practically didn’t exist before the 21st century. With a population made up of 85 percent immigrants and some of the world’s craziest art, architecture and technology, Dubai is charging toward the future—on the backs of camels raced by robot jockeys. Yes. 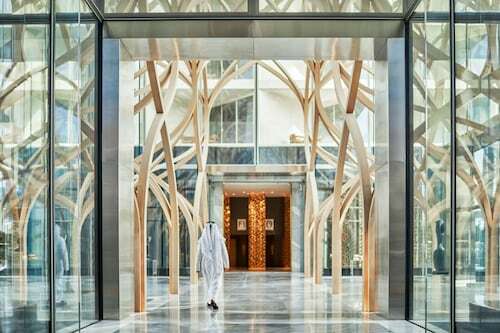 Wotif’s awesome places to stay in Dubai can make you feel like you’re in a sci-fi flick or a tropical island paradise; the choice is yours. Dubai holidays are all about world records, and there’s no shortage of “largest” and “tallest” things here. For example, the Burj Khalifa is the tallest building in the world, and within that, you’ll find the world’s highest observation deck. The skyscraper has even spawned new records like “fastest time to climb the Burj Khalifa Tower” (6 hours, 13 minutes, 55 seconds, if you were wondering). Time it right and you’ll catch a show at the world's largest choreographed fountain system, Dubai Fountain. It’s not all about ritzy records, though. In Dubai, if you can dream it, you can do it, from an indoor ski resort to Russian cabaret shows and 24-carat gold facial treatments. Once you’ve had your fill of records (and food at the world’s highest restaurant—sorry, had to sneak one more in! 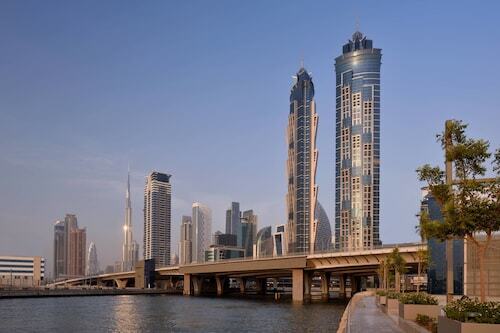 ), head to Dubai Marina for waterfront relaxation. Accommodation near Marina Mall puts you right in the middle of this glitzy, glamourous neighbourhood. Dubai’s famous man-made, palm-shaped islands are near the Marina as well, so you can give your life some “porpoise” with a dolphin encounter. 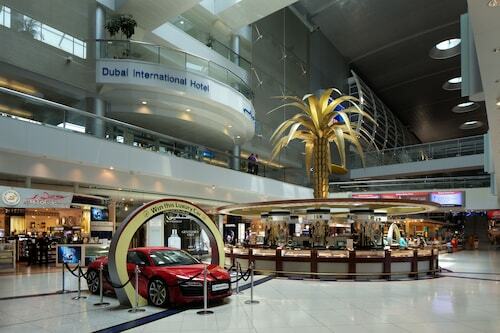 Flights to Dubai land at the city’s international airport (DXB) just 13km from downtown. The Metro system connects the airport with many destinations in the city centre and beyond, and with only two lines, even the most tired travellers should have no problem. If you really need a rest, though, you can doze off in a Snoozecube before journeying on to your accommodation in Dubai. To get around, the Metro can take you to most popular spots, but travelling by car is also a convenient option. Parking garages are plentiful and affordable—just remember to drive on the right-hand side of the road! Festivals and events in Dubai are definitely true to the “go big or go home” ethos (except when it comes to alcohol consumption, of course). During the high season, November through March, there’s tons going on. Love seeing grown men smash their heads together and call it a scrum? You’ll want to visit in early December for the Dubai Rugby Sevens. Prepare for celebrity sightings, and we don’t just mean your favourite hookers and loosies. The Dubai International Film Festival is in early December also, so you just might catch a glimpse of George Clooney—but no guarantees. 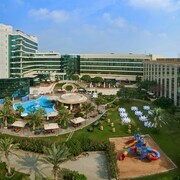 Women (and men) who be shoppin’ should book Dubai hotels during January. Just trust us on this one. This is a city that’s already known as a shopaholic’s playground, and the Dubai Shopping Festival, which runs the whole month, makes it even better. Only serious shoppers need apply: Last year’s festival featured several major fashion collection launches, plus art shows, home goods and more. Ever ridden a camel, gone sandboarding or had a henna tattoo? What about all in the same day? Bust out your bucket list and a pencil, because it’s time to do some checking off when you take a 4x4 Sunset Desert Safari tour. Bounce out over the dunes in search of adventure—and amazing desert sunsets. Nomad your way to a traditional Bedouin campsite for shisha, henna and those camel rides. As Aladdin would say, “Arabian nights, like Arabian days/More often than not, are hotter than hot/In a lot of good ways…” (sung in your best deep voice). Of course, there’s always shopping in Dubai. And if you head to the Ripe Food & Craft Market, it counts as an outdoor activity! This travelling outdoor market features loads of handmade jewellery, artisan crafts and of course, some of the best food in Dubai. Yes, you can finally find that super-expensive rare strain of saffron you’ve been looking for. Or just camel chocolate. Now that’s a unique souvenir. Pop Quiz: Besides shopping, what do people with money love? Golf! 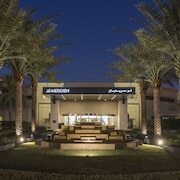 Emirates Golf Club has one of the world’s top 100 courses, and plenty of ice cold beverages you can sip while discussing your birdies and bogies with your fellow bourgeois (or at least pretending). And now a riddle: It looks a bit like golf, and it’s also for rich people. Just change one letter and you’ve got your answer: gold. If you’ve got only one day in Dubai, you have to hit the Gold Souk…and the Spice Souk and the Textile Souk. Luckily, they’re all near each other, in the northern neighbourhood of Deira, so as long as you don’t spend the whole day bargaining (which can be tempting), you’re good to go. Drop your finds at your Dubai accommodation and get moving to some of those world records. You’d seriously regret leaving without a pic from the top of Burj Khalifa and a gander at the fountain show. Watch the sunset from the back of a camel on Jumeirah Beach and check out a different kind of manmade wonder: huge, intricately carved sand castles. We know, we’ve mentioned shopping a lot. But in Dubai, the shopping sometimes isn’t even the highlight. Hit the ski slopes at the Mall of the Emirates (yes, even with real snow!) or float down canals like you’re in Venice at Madinat Jumeirah mall. You should have plenty of time. In a city this obsessed with shopping, malls are open late. With Wotif’s deals on hotels in Dubai, you’ll be quite literally living the high life in the “City of Gold”. Blink and you might miss the city’s next world record—so book today, because Dubai slows down for no one. How Much is a Hotel Room in Dubai? 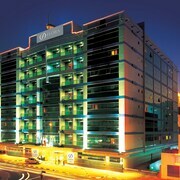 Hotels in Dubai start at NZ$40 per night. Prices and availability subject to change. Additional terms may apply. I like being near of everything, The cleaning of the room needed more attention. I loved the customer service and how the concierge took me to my gate at departure and even walked around until he found a seat for Me! Good customer service also.with reception and in room dining. Only thing I didn't like and this is probably because I booked online and didn't know a staff could meet me at arrival I walked a long way and around in circles to find the hotel there is no clear sign of which way to go. And I walked right past it because there is no sign outside to say that it's there. Maybe have a sign that sits on the ground pointing with an arrow to the double doors, there is nothing to say it's a hotel. But I know now I will send flight details and have someone meet me at my gate.